stablished in 1994, MOLONEY & ASSOCIATES Acoustic & Environmental Consultants have developed hearing conservation programmes for blue chip clients over many years. Some of these have involved leading pharmaceutical industry and highly regulated industries. In some cases, we have developed the entire hearing conservation programme on behalf of the client and in others we have undertaken reviews, bench marking and gap analysis to ensure that the clients’’ programmes meet best practice requirements. An occupational hearing conservation programme is a systematic plan implemented to protect the hearing of employees from damage to hazardous noise exposure in the workplace. 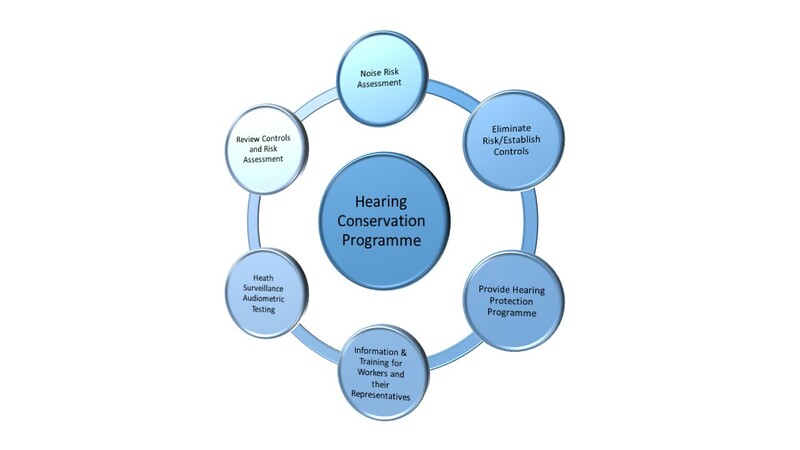 An effective Hearing Conservation Programme (HCP) involves a number of distinct yet interrelated phases and these are best described by means of a flow diagram. The priorities for the HCP involve: a clear identification of the pertinent noise issues, planning and implementation of appropriate controls, periodic assessment, corrective action and periodic review. A risk-based approach should always be adopted with regard to the HCP and each of the individual elements must be clearly addressed within the statutory requirements. Some of the many benefits of an effective HCP include: a structured and coordinated approach to risk management, a reduction in liabilities for potential NIHL claims, improved working environments, enhanced workplace communication, reduced absenteeism, and an improved quality of life for employees.